Brian Robinson Machinery (BRM) continues to be a cornerstone for agriculture in North Yorkshire and the North East. For more than 35 years, farmers and industry personnel have turned to BRM for new and used agricultural machinery. With this in mind, we provide a venue here at East Cowton that serves the local farming community. Although it can be hired for any business meetings or training courses, we also provide it for free for farmers information evenings and local Young Farmer events. Our venue has hosted a variety of evening discussions over the years and is part of our staunch commitment to do right by our customers. We believe in staying connected to our customers and we’re prepared to help by addressing the key talking points within the UK farming and agricultural industry, which affect us all. At the centre of this strategy is our hire venue at our North Yorkshire facility. It is light and spacious and set in our quiet, rural location. You can choose to hire our East Cowton venue for a half-day at £50 or a full day at £100. Please note that those prices are not inclusive of VAT or catering costs. We can also arrange catering if that is required with your booking. 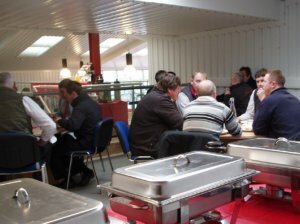 Anything from tea, coffee and biscuits to hot and cold buffets can be provided for your attendees. You also have the opportunity to order delicious hot or cold food options. These are prepared locally by Sarah, the partner of Pete Clark from our parts department. For booking information, please call Hannah Robinson directly on 01325 378552 (ext. 4) or else email him via enquiries@brmltd.co.uk. Hannah can answer any questions relating to costs, catering, cap acity and availability for the BRM venue. Don’t forget that you can use the Goggle map from our contact section to help you find your way here. BRM would like to invite you to submit any ideas you might have for farming and agricultural evenings. 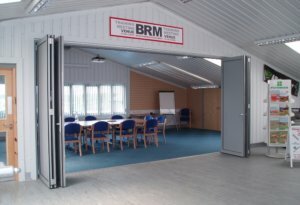 These are held throughout the year at BRM, but we are always interested in arranging new events and bookings.